Harold A. Coghlan, owner of Magic Express Airlines, Inc., an air charter company based in Birmingham, AL, has received the 2003 Safety Officer of the Year Award from the Southeast Region of Civil Air Patrol. Coghlan, a Lieutenant Colonel, serves as Director of Safety for the U.S. Air Force Auxiliary, Civil Air Patrol, Alabama Wing, into which he has incorporated many corporate aviation safety practices. Coghlan has not shown that the NTSB committed reversible error when it determined that the statute of limitations in 28 U.S.C. § 2462 did not apply to his revocation proceedings. Even if § 2462 were applicable, however, falsification of military records in which Coghlan was found to have engaged was adjudicated within the statute of limitations and was sufficient to sustain the NTSB’s decision upholding the FAA’s order of revocation. 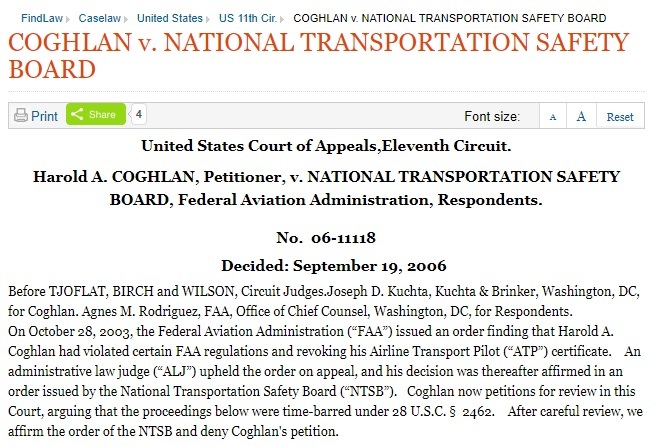 Accordingly, we affirm the order of the NTSB and deny Coghlan’s petition.